Your demo capsule should look like this. the part that needs it. easier it will be to pop later! practice with a cup of water, and make sure not too get too much liquid. any of the scent on the outside of the balloon. 4. 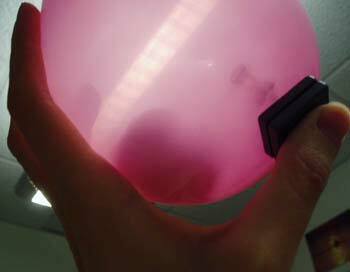 Now add 1 or 2 tacks, being careful not to puncture the rubber of the balloon. is 3-4 inches in diameter (for a 7 inch diameter balloon.) Tie off the balloon to seal it. and pins could go flying and hurt someone!! microscope, so we have made a larger model of them! 1. Smell the balloon and answer the following questions. a. What does it smell like? b. Is the smell very strong? c. Which part of this set-up is like the outer layer of a microcapsule? d. Which part of this set-up is like the “active ingredient” in a microcapsule? your nose, and is found inside the microcapsule. b. The magnets and plastic tacks in this demo are used to release the active ingredient. What are plastic tacks like in the NASA microcapsules? about things that could be improved, starting with your set-up. 1. How could you solve each of the following problems? 2. Which problem(s) in question 1 might be the easiest/quickest to solve? 3. Can you think of other possible problems? If so, list them here. **Try some of your suggested solutions above to see if they improve your demonstration. Extension (at home): Be a museum demonstrator and amaze your friends and family! 1. Complete all the steps in the Activity section. 2. Get your audience. Explain the NASA microcapsules to them (see Introduction). you to open the microcapsule at the proper time. ingredient is free to react.